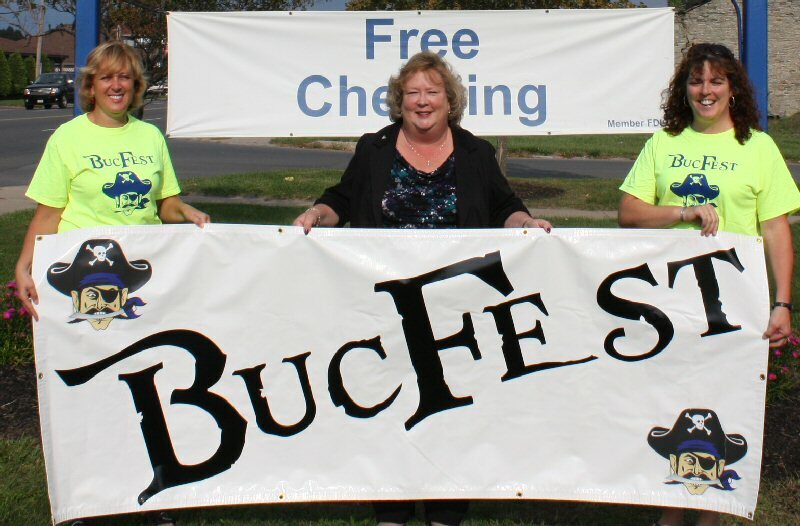 OSWEGO, NY – Pictured in front entrance of the Alliance Bank, 30 W. Utica St., are Buc Booster committee members Lu Collins (left) and Kris Armstrong (right) as they hold the BucFest 2012 promontion banner along with Barb Bateman, senior vice president for Alliance Bank. BucFest will take place Saturday from 10:30 a. m. until 1:30 p.m. p.m., at the end of Joe Wilbur Field (rain location OHS gyms) right after the homecoming parade which will start at 10 a.m. in the lot across from the former Coleman’s Restaurant on West First Street. Immediately following BucFest will be the homecoming game against New Hartford at 2 p.m. The cost of the fifth annual event is $2 and most of the attractions are free. In addition to the festival, the Buccaneer Boosters are promoting a “Buccaneer Blue Week” throughout Oswego, Sept. 24 -29.